"We’re here. We’re in Edinburgh. I can see the castle on the mound and I can see Sir Walter Scott Monument and Princes Street Gardens. I can’t wait until we get to the zoo," Bonnie said, excitedly. "Edinburgh is one of the prettiest country capitals in all the world. The zoo is just around the bend. Ah, there it is now," Bruce pointed. "The zoo. We’re here. What part of Edinburgh is this?" she asked. "It’s called Corstorphine, but its part of Edinburgh and this is the Edinburgh Zoo. It was opened in 1913 and is open every day of the year, no matter what the weather," Bruce said. "I don’t want to hear any history today, Bruce. All I want to do is see the penguins. They are my favorite animal, aside from butterflies, that is," Bonnie smiled. "There are many types of penguins. What is your favorite type?" Bruce asked. "The kind that is black and white and eats fish," Bonnie answered. "They are all like that, Bonnie. I mean, do you prefer gentoos, kings, macaronis, rockhoppers or emperors?" he asked. "I have no idea. Why don’t you show me what type each one is and I’ll tell you the answer then," Bonnie said. "Ah, here are the penguins. I love watching them. See that one, how it dives down and swims about? I can hardly keep my eyes on it. It’s going way too fast," she giggled. "They are fun to watch. Oh look, there’s the penguin keeper. He’s going to feed them now. Do you think they’ll eat out of his hand?" Bruce wondered. Just then the keeper held out a fish and a penguin pulled it right out of his hand. "How funny. It did eat it from his hand," Bonnie laughed and laughed. "This is so much fun, Bruce. Thanks for bringing me here. 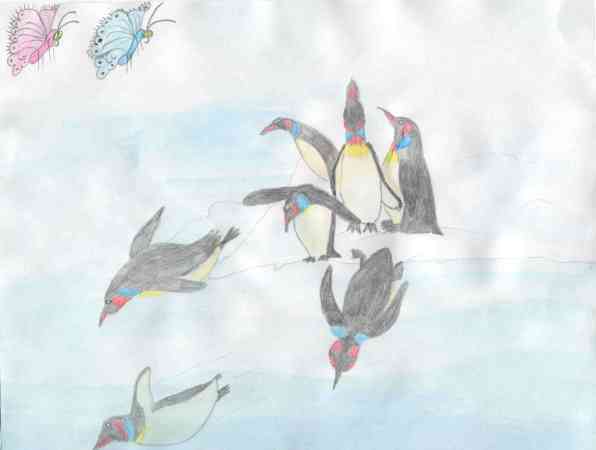 I think I like the emperor penguins the best. They’re cute." They stood for hours watching the penguins eat, swim, slide, push each other and sleep. The sun began to set and the zoo was about to close. "It’s time to leave and head south to England, to the warmer weather now. Oh, how I hate leaving Scotland behind, but we have to go," Bruce said. "It was wonderful seeing the country and this was the best way to end our visit, by seeing the penguins at the Edinburgh Zoo," Bonnie sighed. The butterflies fluttered away, heading south to England. When they crossed the border, they turned around. "Goodbye, Scotland," Bonnie said. "Goodbye," Bruce added and they flew on, knowing soon they’d join all the other butterflies.